Before us are several sketches of the artist, made in the 1890s under the impression of a trip to France. The principles of one of the brightest modernist trends, impressionism, which flourished in the last third of the nineteenth century, fully embodied in these paintings. 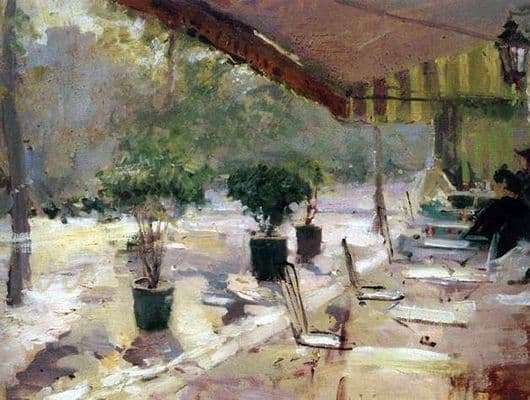 Note that Korovin depicts a cafe in the morning. There are a few more visitors, and the rays of the sun did not have time to lose their silver tint, in which they risk drowning all objects, the whole surrounding world. Tables, street, people – all this loses its contours, slightly blurred. Even the color of a red umbrella, captured in the hands of one of the women, softens and becomes dull. It seems that the artist, as it were, transferred the urban scene caught from the endless stream of life onto the canvas. Looking at the picture, we can recall the poems of some urban poet who conveys in his words the lively life of the city. It is hardly necessary to say that Korovin was guided by the experience of the French Impressionists. At the same time, he cannot be exactly accused of blindly following Monet or Pissarro. On the contrary, the artist sought to experiment. So, Korovin ventured to apply earthy paints in order to achieve the necessary gray tint. The artist actively uses black color, which, however, does not stand out from the general background, does not create heaviness. On the contrary, the canvas, made in the period of the creator’s fascination with silver color, only gives the viewers a feeling of lightness and freedom. In addition, the skillfully depicted streets, fresh greens make the canvases very bright, unforgettable, even elegant, so to speak. 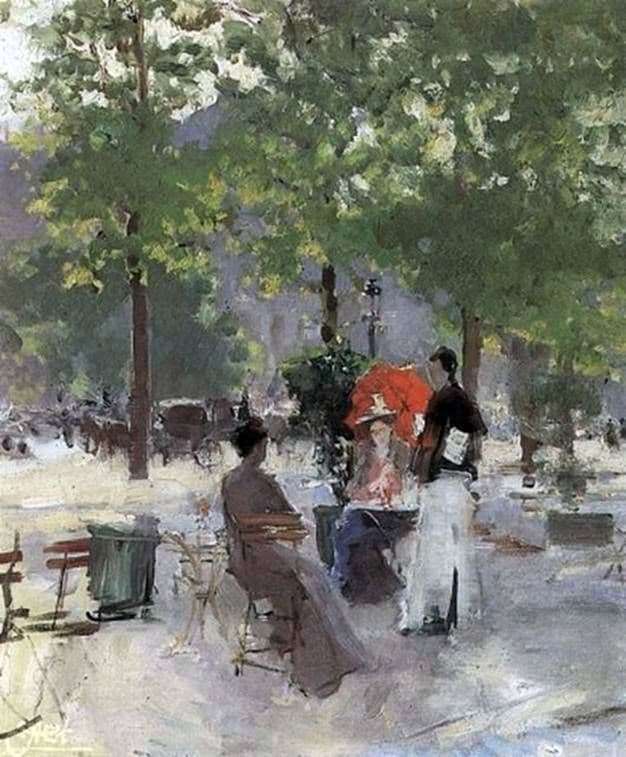 So etudes “Parisian cafes” are worthy examples of Konstantin Korovin’s creative work, undoubtedly delighting fans of his talent. Unfortunately, not all contemporary art critics recognized this fact.